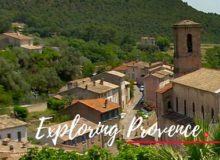 Nestled into the hills and bordering on the Haut Var is an exquisite little village that – despite its beauty – is easy to miss. 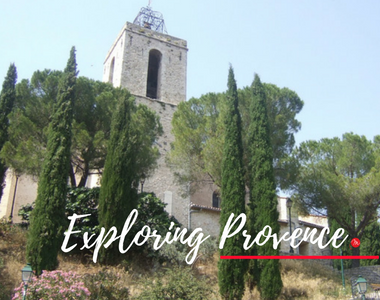 Located just off the main road between Draguignan and Brignoles (where cyclists in the Tour de France sped by in 2011), Flayosc is a quiet village with a surprising amount of activity. The road just above the vieille ville in Les Arcs-sur-Argens takes you directly there, but it is a narrow road that winds up and around the hills and I always feel a bit nervous driving because there is no ‘shoulder’ and the road falls away steeply at the edge of the bitumen. However, you can take a bus via Draguignan for a more relaxed journey. We parked on a bit of rough ground just outside the village and took the first street we could find that led upwards into the town. The great thing about small villages is that you really can’t get lost – even though the streets are narrow and winding, and you can’t always see too far ahead. 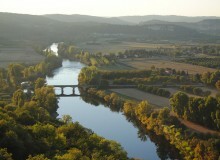 Flayosc is dominated by the unpretentious Church of St Laurent crowning the hilltop and forming the village centre. Inside there is a wealth of artistry, from a brilliant mosaic of St Michael slaying a dragon, to some exquisite tile patterns – almost Middle Eastern in design – that line alcoves behind religious statues. It is a beautiful little building, surrounded by pencil pines and ancient olive trees and you can choose a winding pathway or a series of steps to reach it. A more recent set of stained glass windows has been built into a wall where earlier ones were broken. But that is not all. 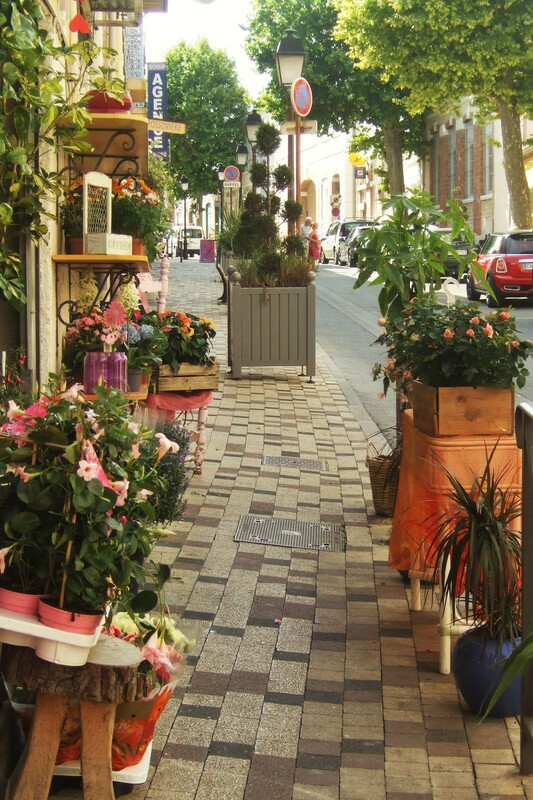 The streets are attractive with small artisanal shops selling all kinds of traditional Provencal handcrafts. It seems that almost every corner reveals a tiny square, complete with a small café or bar-restaurant – some with colourful bunting strung overhead, others with cool, trickling fountains. 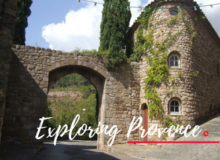 Strolling through the village on a warm summer afternoon, you can plunge your arms into the deliciously cool waters of the town’s lavoir – where people once came to do their communal washing. It is also a gloriously floral village. Pots of all species of summer flowers adorn several florists and many of the balconies and doorways. 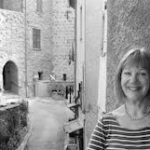 We arrived in the sleepy après-midi and the town was quiet, with shutters up on many of the businesses and we could hear soft murmurs from dark interiors as we wandered by. Here you can find the ‘ébénisterie’ – a woodworker who makes furniture using the traditional methods of two centuries ago; the ‘maroquinerie’ – a family of leather workers who make the traditional ‘gibecières des chasseurs’ (gamebags used by the hunters in Provence); and the ‘rideaux en perles de bois’ – the strip curtains that traditionally cover open doorways in Provence which are made of hand-carved beads from the local olive wood. Sadly, because we needed to telephone in advance, we were not able to visit several places that I have put on my list for our next visit. And we came on the wrong day for a trip to see the moulins à huile (olive oil mills) at work. There is a special one, the ‘Moulin du Flayosquet’ run by Max Doleatto in an authentic 13th century mill where he creates a range of oils from the olives using the traditional methods. But just meandering around the village, stopping for a cool glass of the local rosé, and discovering the beauty of the town itself, its flowers and the stunning fields of olive trees surrounding it, was an afternoon very well spent. Have you ever been to Flayosc? 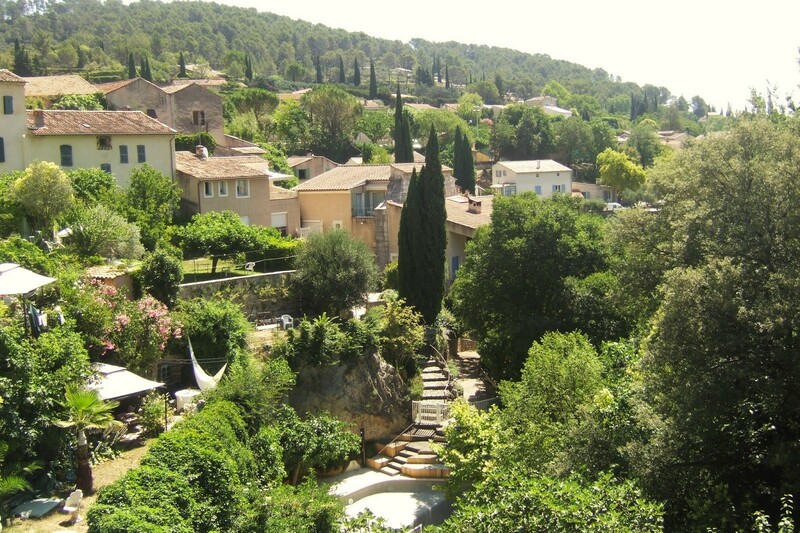 What are your favourite day trips in Provence? Share your tips and experiences in the comments! Both times we have visited Flayosc have been via the main road from Lorgues. 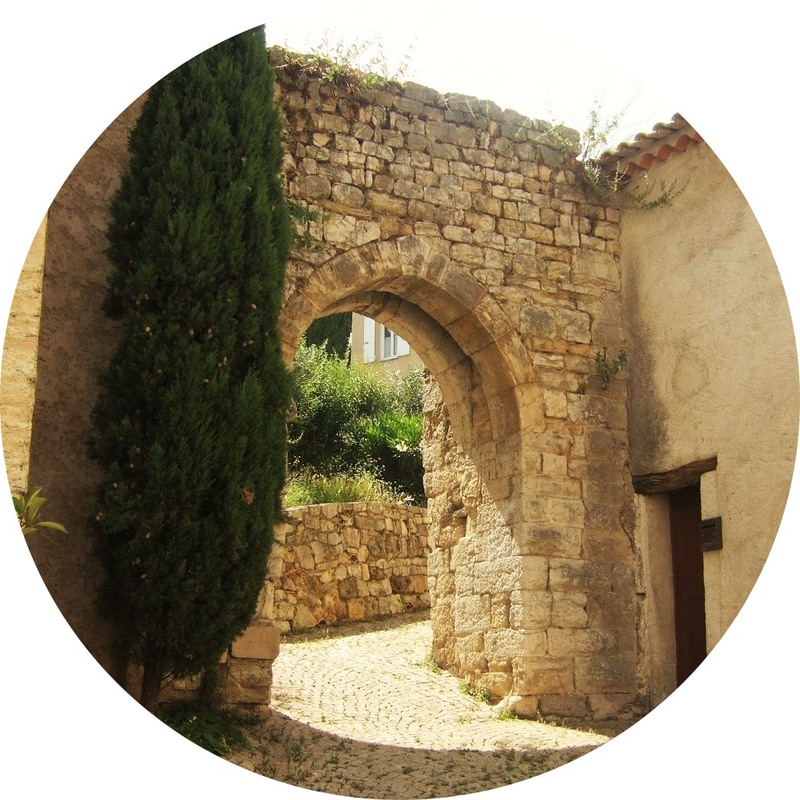 We have found the parking area just beyond the lavoir at the top of the town to be convenient. Wandering around the town is a delight. Between the main square and the lavoir is a lovely fruit shop where we bought ingredients for a ratatouille and delicious late strawberries. Leaving Flayosc we take the Route de Sauveclare, a winding, hilly back road and across two gullies which have boom gates in case of high rain fall. One looked as if it hadn’t been used for some time. One day we will stop at the tiny chapelle at Sauveclare. The other is to visit on market day. The market is enormous – down the long main street and into the next square. Food is together at one end and down a side street. The commune only charges 5€ for a table and refrigerated vans are able to plug into pop-up power sockets in the footpath. After shopping we like to have lunch in one of the many cafes and watch the market pack up. The whole process is a well-oiled machine. Thank you for all your extra information. I haven’t travelled Lorgues to Flayosc, but I’m sure it is easier than from Les Arcs! 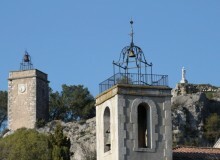 I will also look up the Sauveclare chapel, which I didn’t know about. Lorgues is incredible on market day (Tuesdays) – one of the best I’ve been to in the district. You describe it well. It’s easily accessible by bus from Les Arcs and a wonderful way to spend a day. The Office du Tourisme also has a brochure of chapels in the area. If you go there you might check to see if the one you want is open. We went to a chapel about 5km from town and found the sign on the gate said we could get a key at the Office du Tourisme. There was no note in the brochure! Fortunately we could see the murals on the outside through the gate.